Thanks to KizZBG for this amazing banner! Shudder’s play against Bisu left me cringing. After advancing with a sizable push against Bisu’s relatively early expansion, Shudder sent his vultures on a ridiculous reconnaissance mission along the side of the map. 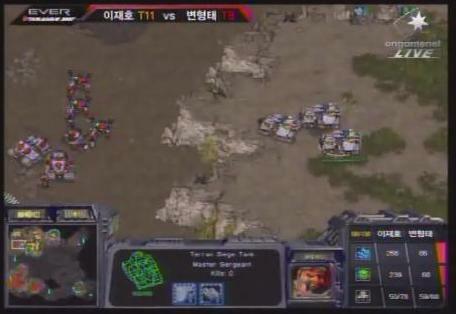 Bisu responded by using his small dragoon force to snipe each and every one of Shudder’s now-undefended tanks. For Shudder, the game was all downhill from there. 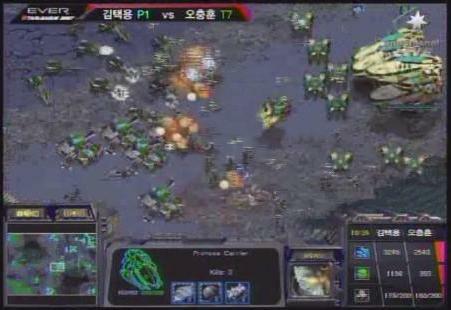 Without vultures, tanks don't do so well against Protoss units. 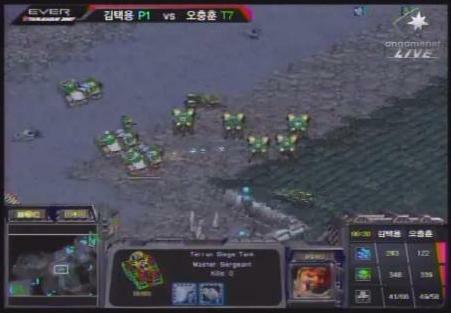 Bisu used his economic advantage and some light harassment to take four additional expansions and start carriers, all while fielding an untouchable ground army. Shudder tried to push into the middle of the map, lost his entire army, and conceded. 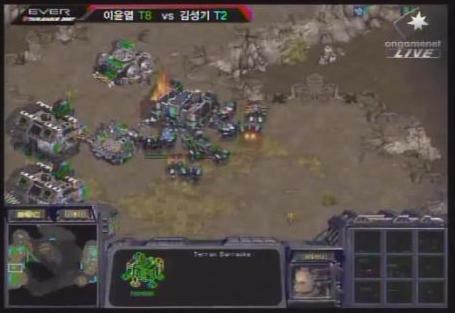 With this win, Bisu secured his advancement into the single-elimination tournament. I'll give you one guess as to who wins this fight. Light vs. Iris was disappointing, as well. Iris’ aggressive play proved completely ineffective on Fantasy II, especially given Light’s easily-defensible position in the upper-left portion of the map. Iris tried not once, but twice, to push into Light’s natural expansion. If it didn't involve quoting U2, I'd make a lame pun about el-ev-a-tion right about now. Light halted each advance with minimal losses due to his elevated position, and he used his troop advantage to dictate the remainder of the game, relentlessly hunting Iris’ expansions with his fleet of troop-laden dropships. Given the need for splash damage under Persona’s permanent dark swarms, DarkElf’s build against Nada was brilliant. While pumping vultures from two factories in his base, DarkElf made a third factory, with a machine shop, just outside Nada’s base. The subsequent stream of tanks and vultures easily overpowered Nada’s fast expansion build. Using his barracks to block Nada's choke was a nice touch, not that it was necessary. Rock’s play against Frozean was typical. 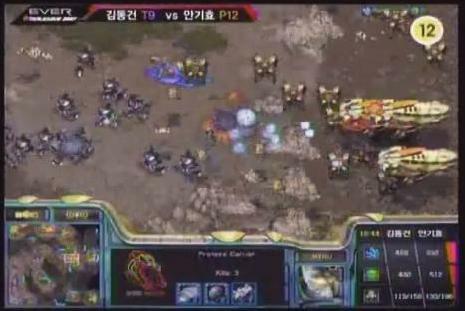 Without using his observers to scout even a single inch of Frozean’s base, Rock assumed it was safe to start carriers and simultaneously expand, perhaps buoyed by Bisu’s earlier success with the tactic. Frozean responded with a six-factory timing push. Rock halted the push with some excellent micromanagement, but Frozean was relentless; he never stopped advancing and reinforcing his army, always being sure to produce the ideal mix of tanks and goliaths for the situation. After Frozean secured a third base and repelled a counterattack from Rock without losing more than a handful of units, the game was essentially over. Note that Rock's carriers are retreating. This was a common occurrence. Credit for these videos goes, as always, to someone other than me. 16 November 2007 Edit: The match layout below is incorrect. I apologize for misinforming you. The correct bracket will be included in the 18 November news post. Ideally, my predictions will come true—and in order. That would give us by far the most interesting quarterfinal matches, with Stork facing off against Flash (though after seeing his TvP today, Frozean would be just as good) and Savior going head to head against Hwasin. And with some help from our talented graphics team, future OSL news posts should include a colorful bracket! Note: In an effort to create posts that are a little more visually stimulating, I've added some pictures to this week's report. Let me know if you love or abhor the change; your feedback will dictate how I approach future news posts. GTR is it really wise for you to be going around nitpicking people's errors when you yourself put up an empty R&S thread and got called out on it. I honestly wouldn't, if I were in your position. The pictures are helpful and carry exactly the gist of the matches (carriers and goons picking off tanks, high-ground defense, slick vultures ...). Good job there! Excellent overview of the games DJ. It makes me feel smart whenever your opinions mirror my own thoughts of a particular game set. I got my fingers crossed for more Stork PvT in the quarters. Although, it would be cool for Stork to have a chance at redemption against Savior. This is shaping up to be an awesome final 8.